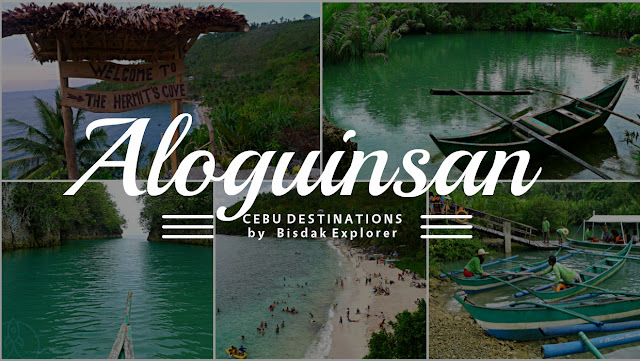 Aloguinsan is a district of Cebu located in the western part of the province. It is comprised of 15 barangays and was once a barrio of Pinamungajan. 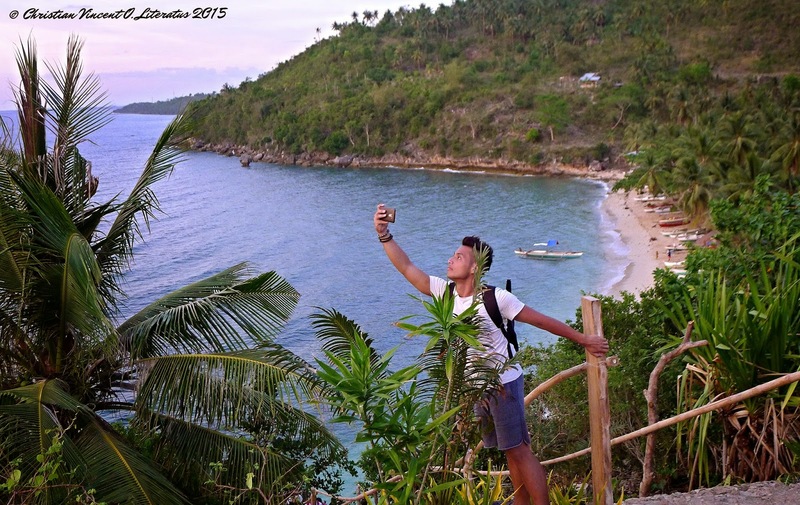 They are known for the beautiful cove and stunning coastline in Hermit's Cove not usually overwhelmed with tourists but what really put this municipality in the map is the unique Bojo River Cruise experience offered to the locals and tourists alike. 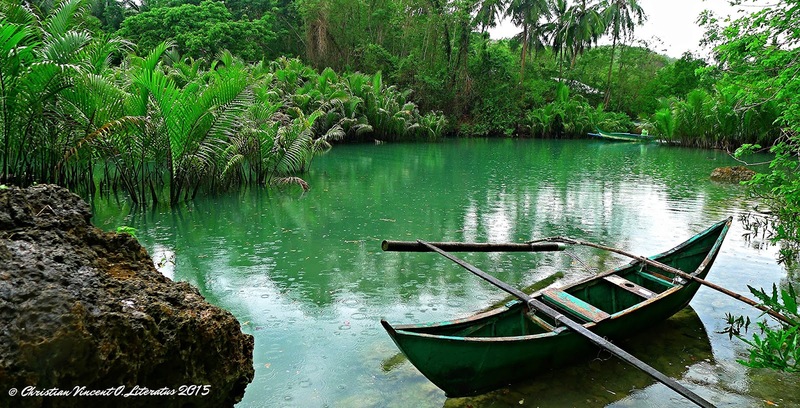 It creates a growing diversity for the visitors in the province which made Cebu now a jack-of-all-trade to the famous spots all throughout the Philippines. You can travel back in time as well by walking through the historical landmarks at the Baluarte Heritage Park. Me and my waterfall chasing buddies have decided to go on a waterfall chasing adventure last weekend again and our itinerary is directed towards Pinamungajan. It was never our intention to explore Aloguinsan because of its lack of waterfall to chase and cave to spelunk. To our horror Pinamungajan have severely suffered the encroaching of human activities that their natural spots such the majestic Twin Falls is all just a shadow of its former self. We may just be seeing them in just pictures because for some unknown reason they directed all the flow of that water to the Wave Pool Resort they are boasting. And the caves are all close now as well due to some safety issues. Imagine all the disappoint that comes out of so much effort. We traveled 20 minutes from the main town to Barangay Lamac and have spent Php 120.00 in the habal-habal to get zero experience in return. Our adventurous spirit have evaporated to thin air that we decided to recuperate & relax on a beach in the next town of Aloguinsan. I have never researched it and did not know what to expect of such decision. All I know that is I need the fresh breeze of the ocean to recover from that disappointment. Naturally, our first stopover would have to be the famous spot in the municipality - Bojo River Cruise. There is a huge signage in the entrance pointing to where you should be going to get to the river. And I must say I was very impressed of the cleanliness of the river. It retains that blue green hue from a distance when you look at it maybe because of the minerals present in the water but when we saw a local fetching the water into his bucket it was crystal clear. I'd say it was close as clear as the infamous Enchanted River in Surigao. I'm not a fan of river especially those with mangroves all over it for this spot it is Nipah Palm covering majority of the river so I'm not itching to dive into the water but companion does. And the biggest party pooper of it all is the ecotourism office who manage the place. They wouldn't let anyone enjoy the river unless you pay the package tour of Php 400.00 per person and this doesn't even include any meal. And if you came in the afternoon without any reservation on a weekend then be prepared to waste all your time waiting for your turn. We are spontaneous people and we wouldn't want to waste our time waiting for one activity to be available and that is not what we came for. When we walk out of the area it was raining really hard and there is no habal-habal in sight. We ask around if how far is the Barangay Kantabogon and it is only 3 km away. We started in a slow pace and decided to run hard when the rain started to get stronger. Feels like a kid again having fun in the rain and that was a wonderful stress reliever for us. Until the girls who got left behind decided to ride a habal-habal. Given the limited time that we have, it is best that we conserve it so we take the offer of the habal-habal drivers passing by for about Php 25.00 per person. The rain had stopped by that time. There are two famous beaches in Aloguinsan and we followed the suggestion of the locals to try the recently established Hermit's Cove. The other one is The Hidden Beach and does have a white sand shore but not as large as the cove. 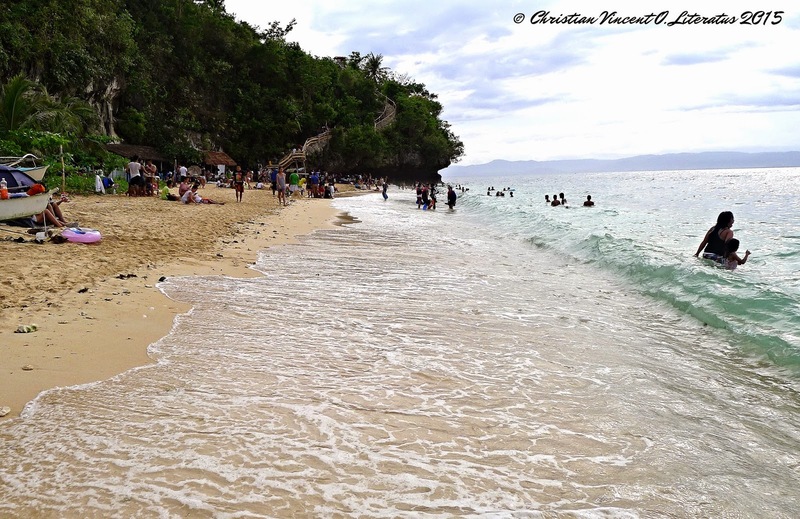 Probably the advantage of Hidden Beach is that it is well established with accommodations and cottages all over. 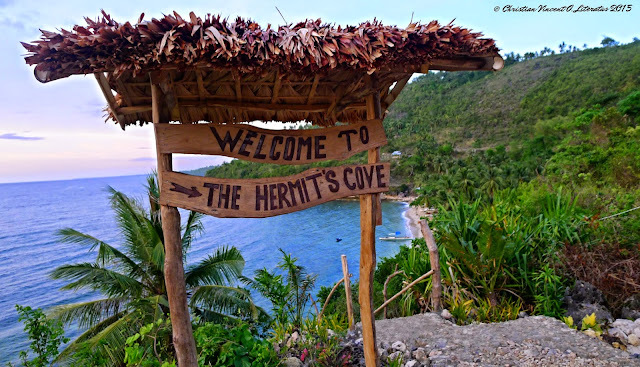 Whereas for Hermit's Cove you go back to basic with so few cottages and tent is the only option for an overnight stay. I must remind that there is always a shortage of freshwater to wash up here. When we got there we were surprised of the huge crowd. It will not going to be a serene experience when we share the coastline with these so many people. Another hurdle is the expensive entrance fee of Php 50.00 per pax as compared to only Php 10.00 per pax for Hidden Beach. We are so used to getting all the nature spots for free that we almost did not want to push through but I am glad we did. 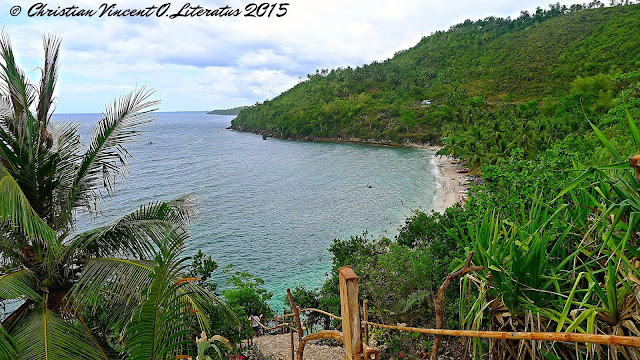 It is a really spectacular cove that I did not expect be hidden in Aloguinsan. The local tourism surely did not made any effort to promote it but I think it best to stay hidden that way it stays unspoilt. The quality of the sand is a very important factor for me but I am glad to say it is passable though there are rough sea shells and corals in some part of the shore. The color is not very consistent as white though and it can appear more cream than white and hidden beyond that water is a sea floor full of rocks. 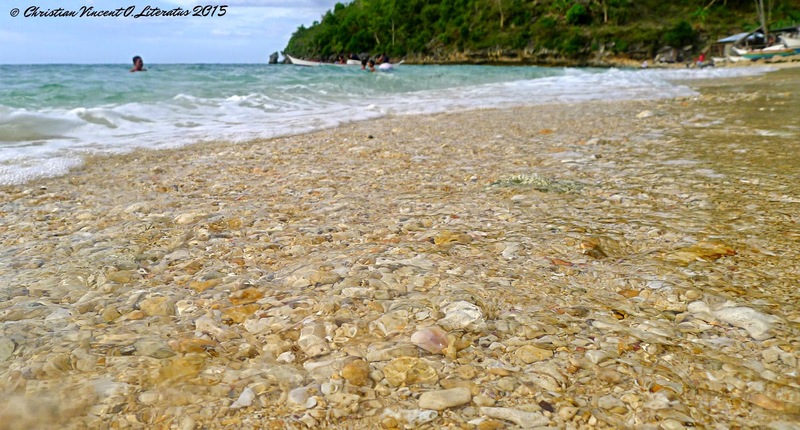 There is a snorkeling spot as well which will cost you extra. Time really does slows down when you are having fun and that's what we did. We enjoyed the water, inhaled the fresh sea breeze, play around with the sands in our feet and the best part is the booze which is the key for a super fun conversation. 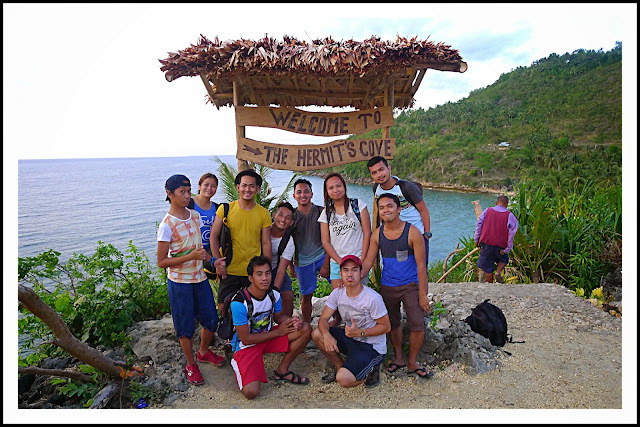 It is one of the memorable moments of our group because most of the time we barely have a fun talk and spend most of our time either walking through a rugged terrain, cliff diving some waterfalls and taking pictures. 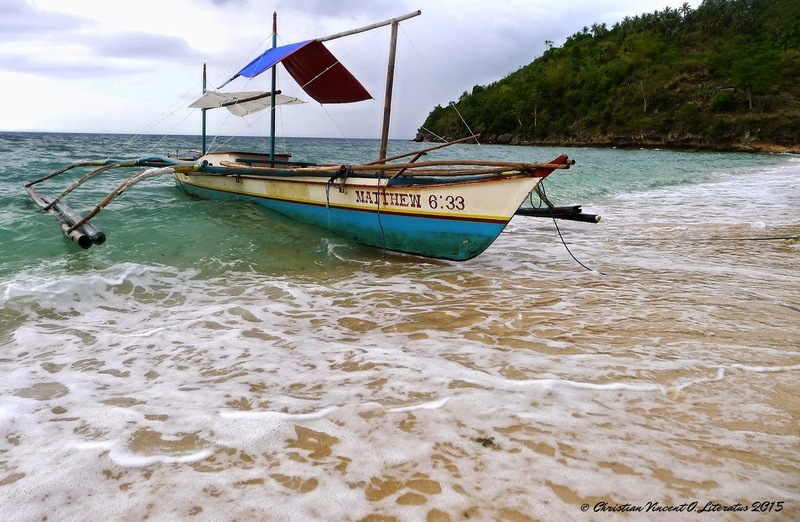 I was reminded of a lesson that I learned from this experience through a boat. Things don't always go as we planned and it will definitely pissed us off but rest assured to those who are aware that we have a good God and He has your best interest at heart. Note: Waterfalls are dried up and caves are prohibited. You can enjoy the Wave Pool in Hidden Valley Resort for Php 150.00 per pax admission fee. Note: It is best to call for a reservation first or come really early especially on weekend because they have difficulty in handling huge sum of tourists. Note: Tents are the only option for those who wants to stay overnight. Note: They have comfortable cottages to offer if you want to stay overnight. All of us saying goodbye to the awesome experience we had.